Let’s Rank The Grand Theft Auto Games, Best to "Worst"
We did it with Halo, so let's do it with another of the world's biggest game series, Grand Theft Auto. And by "it", I mean rank the games from "best" to "bottom of the list". Why? You might be new to the series. Or diving back into it. These games take a long time to get through, so you should probably start with the good ones first. Or... you might just be arguing with friends. That's the beauty of these things. With a series like Grand Theft Auto, every game has its ups and downs, its pros and cons, and exploring just what ticks people's boxes can be a blast. 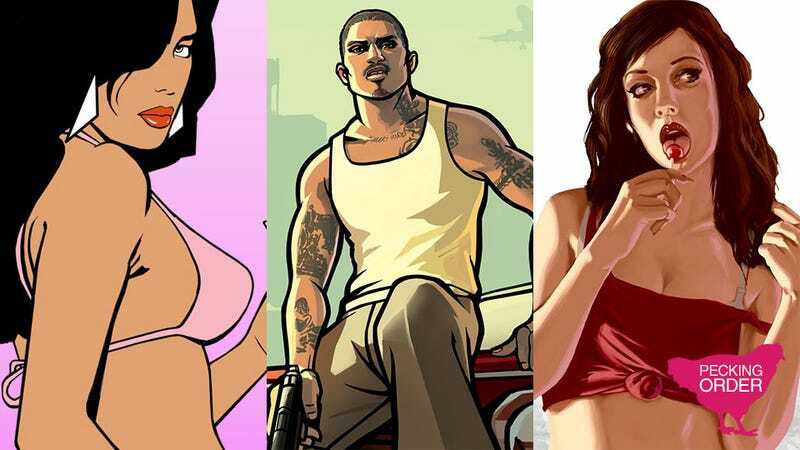 Before we dive in, a few notes: these aren't Kotaku's picks for the pecking order of the GTA series. They're just mine. You'll no doubt find my colleagues chiming in below with their two cents! Also note that, like with Halo, I've had to set some boundaries on what I'm including and what I'm not. It was a lot tougher to draw a line in the GTA series, since it spans so many platforms (and even decades), but at the risk of offending purists I've decided to stick to just the standalone titles. That means no "Stories" or "Episodes" titles, as by sharing a map they're sharing half the experience (making them more of an expansion, in my opinion, even with their own stories), but I'll consider them as part of the main games they're based on. It may not be the perfect Grand Theft Auto game, but it's the perfect Grand Theft Auto experience. Sure, on a superficial level it's the car chases and gunplay that make a GTA game fun, but it's the strength of the world that helps set these games apart from each other. And no world was better realised than Rockstar's take on 1986 Miami. The first time you drive past pink neon lights while Jan Hammer plays on the radio, you'll feel, just for a moment, that you're quite literally back in the 1980s. It's a little bit terrifying. It also helps the game boasts perhaps the series' strongest assortment of characters, led by Ray Liotta's Tommy Vercetti, who is nevertheless outshone by William Fichtner's coke-addled lawyer turn. Drab as it may be, Rockstar's most recent entry in the series built a world so rich they could put three stories in it and still make parts of the map feel brand new. While dialling back the chaos of San Andreas upset some, for me it was a welcome move, the added "realism" of 2008's Liberty City creating a virtual metropolis that lives and breathes like no other in all of video games. The most revolutionary entry in the series, as it's the one that brought the franchise into the 3D world, I don't think GTAIII gets enough credit for the strength of its map. While the story and characters aren't so hot, Rockstar clearly finding their feet in that regard, GTAIII's map is I think the best of the entire series, because it's small enough, and each street is unique enough, that it doesn't take long to learn the entire thing off by heart, something that's almost impossible in later games. Why isn't this higher? I thought San Andreas overreached. The RPG stuff they added to the game wasn't enriching, it was annoying. The size of the map wasn't a good thing, it just meant there were plenty of places you'd get stuck without a vehicle. And I don't think the whole early-90s thing was done as well as Rockstar's treatment of the mid-80s in Vice City. Yet... good Lord, it's a big game. And a crazy one. Rockstar brought that back with GTAIV's Gay Tony (the return of parachutes, etc) because, while world-building can be important, sometimes you just want to fly a jet fighter around then parachute onto the roof of a truck before blowing it up with an RPG. It's not as pretty as bigger games, or perhaps even as engaging, but it sure is interesting, both because of its focus on Chinese-American gangsters (something not really covered in previous games) and its novel control schemes, which brought a unique GTA experience to platforms like the DS and mobile phone which previously (and still have to) suffer poorly-implemented ports. Why is this the best-ranked "original" GTA game? Because it remains the only GTA game set outside the United States, which by default also makes it one of the most interesting. I was never the biggest fan of the original 2D games, as the viewpoint deprived them of the sense of place and scale that are so important to the 3D games, but GTA 2 at least introduced a number of key features found in later games, like the ability to save your game and to perform different missions for different gangs. Not a bad game by any means—it spawned this series, after all!—it's just got little to recommend it over any of the games listed above unless you're writing a paper on the history of the franchise. The less we say about this, the better.